Another boring, common shadow 2. A friend bought this last year, put 50 rounds down the tube and never shot it again. He called me last weekend and asked if I wanted it. Uh.. yes! I traded him 2 S&W revolvers (I hadn't shot in years), some speed loaders and 250 44mag brass. I got the shadow, 7 (!) brand new MecGar 19 round mags along with 1K 45acp and 357mag brass. For reloaders, receiving brass is like consummating the deal! Very surprised by how much I like the thin aluminum grips. 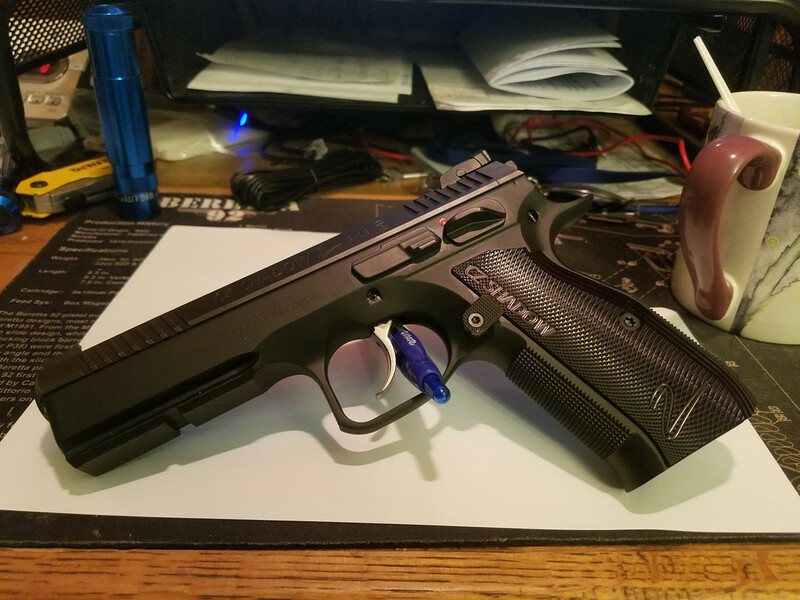 Ordered a set for my SP-01 last night! Feels great, points great. Being left handed I'll think about putting the extended safety on the right side. May not as any competition you start hammer down, safety off. Trigger is good, but not what I thought it would be. CGW to the rescue. Very happy and can't wait till next Saturday to sling some lead! Neither common nor boring! Sounds like you both got what you want. You planning on competiting with your Shadow 2? My gun club finally has steel challenge and I've been shooting the matches with my S.A. range officer in 9mm. Need to order a comp-tac holster and some range time before the shadow 2 sees a match. I shot IDPA for a while. The matches were fun but very biased against left handed shooters. And I was usually the only lefty shooting. The people that showed up killed it for me. Nice. Steel Challenging can be quite fun and is a great segue into USPSA if you have a club near you that offers it. I shot IDPA for a while, it can be fun but as you pointed out it depends on the people and stages (which can be said of any match). The new rules IMO were an improvement, however from what I understand the Shadow 2 doesn’t make IDPA’s weight limit (not without a serious diet) so that’s kind of moot. I purchased about $50 worth of springs and extended firing pin from CGW when I got my Shadow 2 and that made a big difference towards improving the already pretty good stock trigger pulls. Bladetech holster, BOSS hanger, and I was ready to go. CompTac makes some good gear. There is USPSA, but I'd have to drive some. I'm a field service tech during the week and like to avoid driving on the weekends. At my age I'm more about having fun then competition. Own and like bladetech holsters, comptac seems to offer more for lefties. Look like you both got a great deal !